Metrohost is a WHMCS 7.6 hosting theme that is multi-browser compatible. 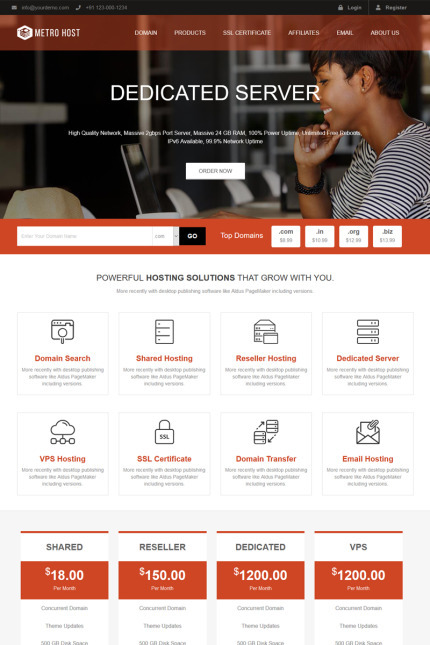 latest WHMCS provides an ideal platform to web hosts for displaying their products and services in an appealing yet professional manner. Visual appeal is enhanced by elegant menus, attractive hosting icons and hover effects. This multicolor WHMCS theme is highly customizable with simple steps and is available in 12 attractive colors to choose from.